If you are ready for a trip then do so in this road tripper t-shirt. You can get this road trip t-shirt in many colors and in styles for men and women and it even comes in many sizes ranging from Small – 6XL. 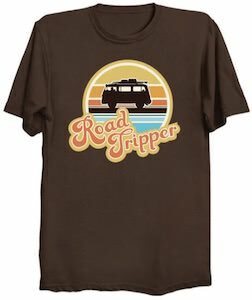 On the t-shirt you can see a circle in which you can find a classic camper van as it is fully loaded on it’s trip and then on top of that covering the edge of the circle you can find the text “Road Tripper” because then people will know that you are ready for the next trip on the road.